Is there a better alternative to TiVoTool? Is TiVoTool really the best app in Video category? Will TiVoTool work good on macOS 10.13.4? 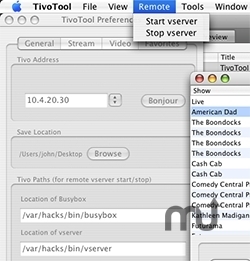 TiVoTool allows you to download, stream, or burn videos from your Series 1 or 2 TiVo or DTiVo. It is a front-end tool (perl script) and GUI ( for OS X 10.4) to pull MPEG2 files (.ty unscrambled) off of TiVo (via vserver hack) for playing in QuickTime 7 with the MPEG2 plug-in. You need vserver running on your TiVo for TiVoTool to work. vserver can be found here. TiVoTool needs a rating. Be the first to rate this app and get the discussion started!